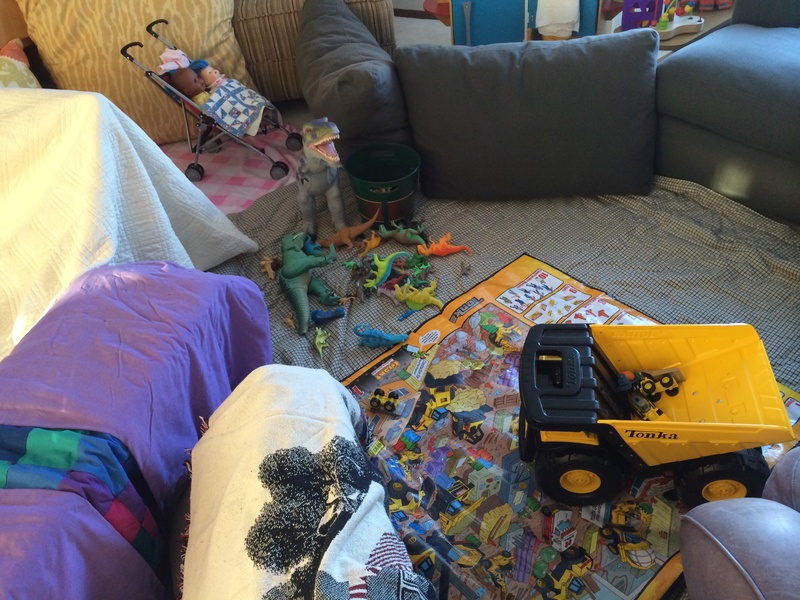 The fort measures (roughly) 10ft x 7ft and is composed of three main areas: nursery, dinosaur room, construction site. The nursery or “baby room” has a pink and white fleece floor with tied edges. A bookcase and corner chair create one wall support, while a floral deco pillow hides any unsightly detachment with shabby chic warmth. Two babies, Harriet and “baby” are inside, cozy in a red stroller and blue and cream antique quilt. We chose a green and off white cotton floor for the dinosaur room. The walls, mainly charcoal cushion since we required a substantial material for this mostly freestanding area, are placed at unexpected angles as a modern and practical balance solution. Jumbo T-rex and a large bucket of dinosaurs inhabit the space, though I have discovered miscellaneous guests as the day unfolds. (Dinosaurs are so social). The construction site, though well intended, fell a little flat. The Tonka mat had to be laid askew with turned up corners due to fort width. It might have been a failed space entirely, but the spirit is in tact due to the XXL bright yellow dump truck with industrial wheels. We’re grateful! The broadest wall, spanning both nursery and construction site, is the highlight. We covered the wide panel wooden chair with an ivory quilt for the impassable piece, offering a castle-like corner in contrast to the more accessible “peasant” patterns. Next to it, the white metal computer bench draped in purple, teal and blue acts as a tunnel entrance. Only children fit through. No roof. This is a difficult and understandably disappointing reality, but early on in the process we were faced with a decision: size or ceiling. We chose size. I am resolved this was the best choice for the day knowing that the morning will opportune a roofed redesign to our current walled city. Three older brothers, an advantage in adventure play, perhaps stunted my fort-building experience. Simply happy to dwell in the results, I was infrequently an architect of our endeavors. The New Year brings new challenges and I am learning, getting better every hour and blessed with a patient and enthusiastic client. I do like the expanse and utility of it – and ceilings are so confining. Great use of color – and quite comfy. So many childhood endeavors are fleeting. Thankfully fort-building seems to be one that lasts for years! We still had several forts this Christmas break, with 12 – 14 year old architects and crews. Delight! 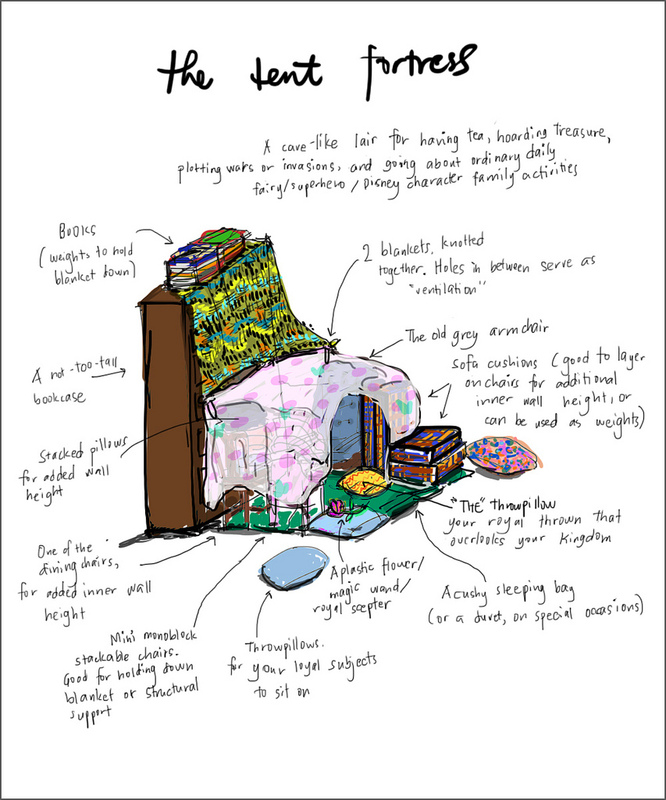 Fabulous job – for a novice fort-builder especially. Well said, well-designed, and go dinosaurs!